With a few simple materials, you can make these attractive candle holders, or “votives” as you can call them. They were blogged about by Claire from Fellow Fellow and put on Say Yes, and they’re quite nice looking aren’t they. Note: this article uses regular cement, but you can also get air-dry clay from art stores and can do even more things with crafting vessels and ornaments. 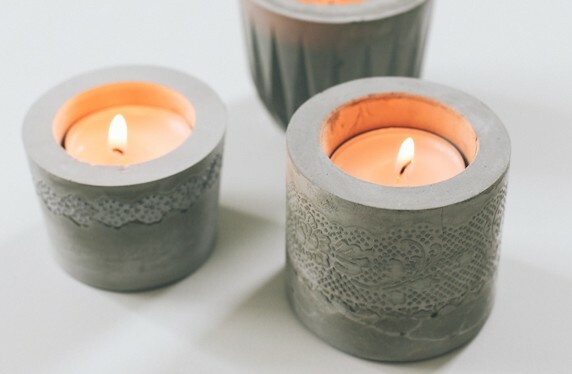 Crafters can use these cement candle holders for outside on summer nights or on the table, in bedrooms, bath-sides, anywhere. You can buy cement from any large building store, but once you have it, and you’re making cement crafts, you can take the cement powder and put it in clear plastic bags. Take your lace (use lace that’s not too wide) and wrap it around the inside of your cup. Then mix your cement in that cup. Then take your other container (the smaller one), lubricate the outside of it, and put it inside the cement and fill it with some coins in it. Let it set for 8 or 12 hours, even 24 if you want, and take off the outside container. The sandpaper’s for removing any sharp edges. Now you can put candles or tea lights into your craft cement container. Previous Article Concrete DIY Flower Vase You Can Easily Make Yourself!